The STIHL iMow® RMI 422 P robotic lawn mower is a self-mowing lawn mower that mow up to 1/4 of an acre of grass to give you more free time. 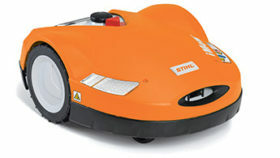 The STIHL RMI 422 P iMow robotic lawn mower is perfectly at home on small lawns, around pools and even yards with steep slopes or a lot of corners. It can mow lawns of up to a quarter acre in just a few hours. Once installed by Gardenland’s professional robotic mower team, the iMow cares for your lawn automatically and according to your desired mowing plan. Mow up to 4 zones – iMow can be programmed to mow a variety of different yard layouts (like a front or back yard). Perfect cut & healthier lawn – the self-mulching mower cuts the grass into tiny pieces creating an organic fertilizer producing a healthier lawn. 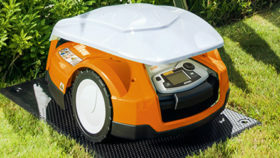 Ultra Quiet – iMow mows so quietly, your neighbors will hardly notice it’s there and you can program it to mow at night. 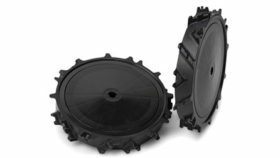 Easy to schedule mowing within a set timeframe called Active Time. Rain sensors tells iMow not to mow and to catch up on the lost mowing time later in the week. iMow is capable of mowing in the rain and the rain sensor can be deactivated. Safety and Security – iMow is equipped with a variety of sensors. As soon as someone attempts to lift it or tip it, the mowing blade is designed to stop. A user’s defined PIN number can be set so that iMow’s menu can only be accessed after entering it. The PIN number cannot be changed – even if the battery is removed or the unit is reset – to reduce the possibility of theft. Allergy Relief – iMow doesn’t kick up dust and dirt like a traditional mower which helps provide relief for people with allergies. Zero Emissions – powered by an advanced lithium-ion battery, iMow emits no emissions while mowing. 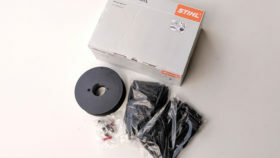 Cutting Height: .8 – 2.4 in. Average Mowing Time (Per Battery Charge): 60 min. Average Charging Time: 90 min. Weight (Including Battery): 20 lbs. Dimensions (L x W x H): 24 x 17 x 10.5 in.